Apple has announced a new Intel 'Nehalem' powered Mac Pro billed as twice as powerful as previous models. The company has branded the new systems as 'Beauty outside. Beast inside'. There were rumours abound that Apple was to update its product range later in the month (24 March) but its online store went down earlier today, which always means one thing – new releases. The new Mac Pros utilise Intel 'Nehalem' Xeon processors which can run speeds up to 2.93 GHz. As standard, the machines come with Nvidia GeForce GT 120 with 512MB of GDDR3 memory, an unnamed 'high-performance graphics card' (three times the power of the last systems, according to the Fruit House) and an optional ATI Radeon HD 4870. Good news for those who like to mod their systems, as Apple has tweaked the interior of the computer so that you can expand memory and the like to your heart's content, without the worry of messing with components that could harm your system. Software-wise all new Mac Pros will come with Leopard OS and iLife '09. The new quad-core Mac Pro will retail for £1,899. For this you get a 2.66 GHz Quad-Core Intel Xeon processor with 8MB of L3 cache; 3GB of 1066 MHz DDR3 ECC SDRAM memory (expandable up to 8GB); NVIDIA GeForce GT 120 graphics with 512MB of GDDR3 memory; and 640GB Serial ATA 3Gb/s hard drive space. 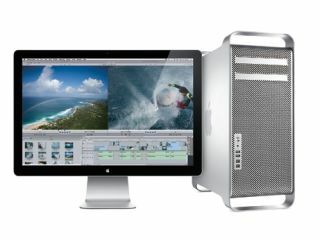 Also available is an 8-core Mac Pro, with a suggested retail price of £2,499. This comes with 6GB of 1066MHz DDR3 ECC SDRAM memory, which is expandable up to 32GB. The 2.93 GHz models are built to order, so no prices are given for these. Apple's Mac Pro range of computers originally debuted back in August 2006. This latest update is the first from the company for over a year.